TRADIZIONI - Il ristorante La Cucina della Ghianda si trova in via dell’Agnolo a Firenze. Propone una cucina semplice e di qualità, con grande attenzione alle materie prime e al rispetto delle tradizioni culinarie. PIATTI FORTI - La cucina si basa sulle tradizioni toscane e mediterranee, rispettando stagionalità e genuinità degli ingredienti. Lingua, muscolo e trippa sono le specialità della casa, ma non mancano spaghetti alle alici, arista in porchetta, coccoli caldi con salumi e molti altri piatti popolari e preparati con ricercatezza. CANTINA E ACCOGLIENZA - Anche i vini vengono selezionati con cura scegliendo tra produttori di qualità. L’atmosfera del locale è rilassata e accogliente, dove ogni ospite è trattato come se fosse un amico. A pranzo la formula è self-service. Very good food. Big portions. Free appetizer and limoncello shots. Friendly staff. Thoroughly enjoyed this dining experience. Very friendly and welcoming. Service A1. Food was wonderful and the atmosphere relaxed. Definitely recommend. Lovely spot with a wonderful atmosphere. The waitresses were kind and helped us to have a perfect time! They were able to work with my wife's Celiac's Disease (gluten free) so she could enjoy as well! I highly recommend this location for any romantic, family, or even casual dining experience. So kind service, delicious food, reasonable price. Highly recommended. We went there for the NYE dinner, it was a special menu, everyone was very kind. The dishes were excellent, maybe it was a little bit long at the end but we had a beautiful night. Every food we ordered was delicious, our waitresses were very helpful. Definitely would go again. Everything was excellent! We started with slow cooked pork over beans and onions, moved on to lasagna, finished with rosemary steak, and enjoyed house Chianti wine all the while. One of the better meals I've ever had, and great service. Very attentive and printed up menu in English for us. We had a nice chat with the waiter and everything was delicious! This is a fantastic place to experience the cuisine of Florence. The service was excellent and all of the dishes we ordered were superb. Try the beef tongue starter - can't say enough about how delicious it was. We are already booked for dinner again for our last night in Florence. very friendly service, fiorentina meet was good, but expected it to be more tender for this price. good experience over all. We enjoyed this restaurant and the sever(s) were really nice and helpful. It's a little off the beaten track, but it is worth it if you want a good meal at a modest price with great people. I appreciated that the music was kept at a low volume, yet the tunes were modern singer/songwriter tracks that were interesting. No complaints. Great service and great food. I recommend the tagliata but everything is good. The perfect blend of warm hospitality and exceptional cuisine!!! Highlights include everything on the menu - seriously can not go wrong with any of the menu items. The restaurant was recommended by friends. Incredibly fantastic food and service and a really delightful evening. 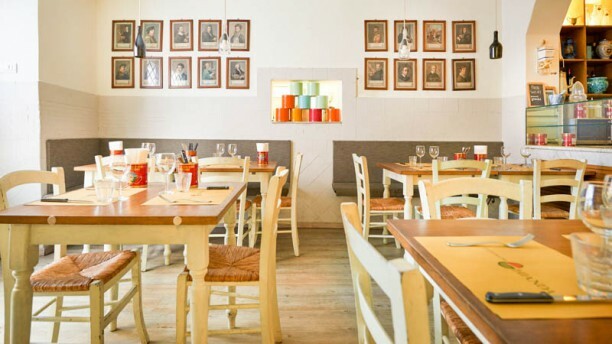 La Cucina del Ghianda is a beautiful small space with wonderful food and atmosphere. Many locals present. Food was excellent! Staff were warm, happy and involved. Our "guide" for the evening was Christopher, and he steered us right in every way, with help for our meager skills in Italian, to food suggestions and explanations. Absolutely loved it. Would go back anytime.